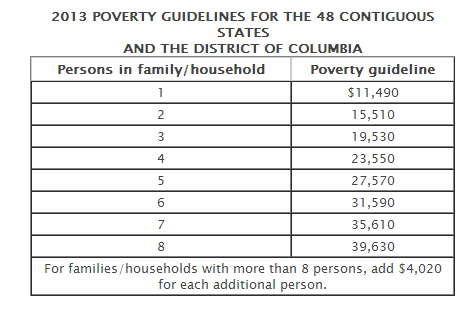 Would You Be Considered Poor Based on Federal Poverty Levels? Andy (Author) Friday Saturday 1 Comment on Would You Be Considered Poor Based on Federal Poverty Levels? See the table below for the latest federal poverty levels (2015 and 2016) published by the HHS. [Updated with 2013 poverty levels] How much does your household income need to be under to be classified as poor in America? The answer of course depends on how big your household is but for the average American household of four people, the answer is $23,550 ($500 more than in 2012). The Census Bureau and Department of Health and Human Services (HHS) which publishes official federal poverty levels, estimated that over 15 percent of US households live in poverty! Fortunately my household (of 4 people) income is well above the poverty threshold but it is hard to believe that a family could live on just $23,550 a year. Especially if they live in a mid to large size metro area. Heck, my total mortgage payments for the year are more than this amount. Based on the latest data, the average American household makes a median income of around $50,000. Or roughly twice the poverty level. This suggests that a lot of American families are not that far from the edge of poverty. Sadly the recession has exacerbated things with income inequality growing as the rich benefit disproportionately more from booming stocks markets while the poor struggle with stagnant paychecks and rising inflation. Another area closely associated with poverty are food stamps. According to U.S. Department of Agriculture over 47 million Americans are receiving aid via food stamps, an all-time high. The cost of providing this program has more than doubled in the last four years to a record $76 billion. The food stamp program, officially known as Supplemental Nutrition Assistance Program (SNAP), benefits eligibility thresholds have also risen in 2013 (see table below) with roughly $30,000 being the gross income limit to qualify for aid in a four person household. The sad thing is that even if you qualify for food stamps, the maximum monthly benefit for a family of four is only $668. Barely enough to deal with the rising costs of food. My monthly bill is almost double that amount – even with coupon shopping. How Much Could I Receive – Allotment Details?